The mission to Mars is a multistage journey that involves sending three cargo vehicles to Mars in addition to the crew transport vehicle, the Terra Nova. With the exception of the Earth Return Vehicle, which launches the crew into space and attaches to Terra Nova, the vehicles will be launched into space in parts using an heavy lift launch vehicle and then assembled in low Earth orbit. The cargo ships and Terra Nova will be sent well in advance of the crew, ensuring the vehicles will be ready and waiting for the crew on Mars or in parking orbit around the red planet. Although all three cargo transit vehicles use very similar exterior aeroshells, they will contain very different cargo. The Shirase cargo lander will transport tools and supplies the crew will need on Mars, including the Surface Exploration Vehicle rovers, the wireline drilling and the surface power reactor. The second cargo lander contains the Mars surface habitat, the Atlantis, while the third cargo ship will transport the Mars Ascent/Descent Vehicle, the Gagarin, to Mars orbit where it will wait for the Terra Nova to transport the crew to the surface of Mars. Each cargo ship must arrive safely to its destination in order for the crew to successfully land and carry out their mission on Mars. The crew of Project Olympus will be launched into low Earth orbit in a vehicle resembling the command module of Apollo-11, the first lunar lander with a human crew. Relatively small, it will contain seating for the crew, controls, electronics and communications systems and protective heat shielding. Once it reaches low Earth orbit, it will dock with the assembled Terra Nova, the craft that will take the crew from Earth to Mars. Although the crew will transfer into Terra Nova for the duration of their journey to Mars, the Earth Return Capsule will remain docked, returning the crew to Earth at the end of the mission. 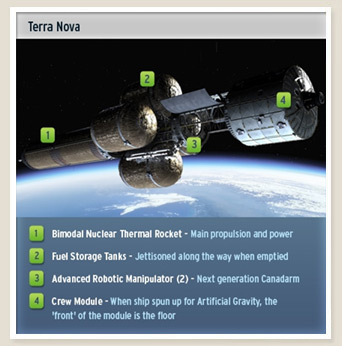 The crew transit vehicle, the Terra Nova will be engineered around a truss-based structure of supports and joints that will connect four drop-fuel tanks, an in-line tank, the core stage, the docked Earth Return Vehicle and the six-person Habitat Module. It will weigh approximately 325 tons and will be powered by the nuclear reactor. 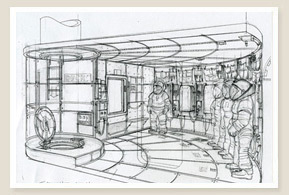 The cylindrical habitat module of the Terra Nova will house the crew in three levels of living and work space. Equipped to function in both microgravity and artificial gravity, the Terra Nova has ample storage for food, oxygen, water and supplies, including a freezer for food and some medication. Because of its location along the walls, the stowed supplies will provide extra radiation shielding. The crew compartments (compact rooms for sleeping and privacy) are encased in materials that provide the maximum amount of radiation shielding. While the recreational area is equipped with telecommunications screens for communicating with Earth and watching movies, a window will allow the crew to literally stare out into space. The habitat module’s full kitchen includes a food preparation station, a convection oven that doubles as a microwave, a sink, dishwasher, coffeemaker and utensil storage. To accommodate all six astronauts, there will be two washrooms on board. Although crew members will only use the shower once every three days to conserve water, they will stay healthy and fit by using on-board exercise equipment and visiting the medical bay as required. For exit to other vehicles or exterior repair, the airlock area is equipped with an Extra Vehicular Activity (EVA) preparation area. After the mission is complete, the Terra Nova will remain in space in a heliocentric orbit around the sun. The MADV (Mars Ascent/Descent Vehicle) Gagarin is a vertical lander. The crew will use the rocket-propelled Gagarin for two short duration flights: landing on Mars and later, ascending back into space. To allow the crew to transfer between the Terra Nova and the Gagarin, the two ships will dock together in Mars orbit. The Gagarin will remain in Mars orbit after the crew has returned to Earth. 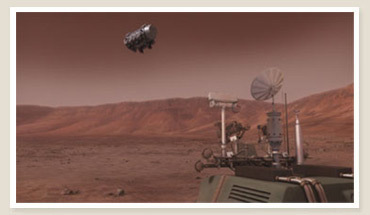 On Mars, two battery-powered Surface Exploration Vehicles (SEV) rovers will transport the crew from the landing site to their surface habitat, and allow them to explore the area. Each rover carries three astronauts, and because the rovers are unpressurized, the crew will have to wear their spacesuits while on board. Like a cross between an all-terrain vehicle and a pickup truck on Earth, each of the ruggedly-designed rovers will have a small flat bed for transporting samples and equipment. The rovers are rechargeable via the Surface Power Reactor. 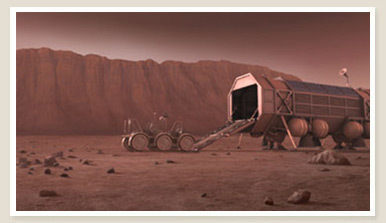 The compact nuclear Surface Power Reactor will provide power to the surface habitat and equipment on Mars. Only a meter wide and three metres high, the Surface Power Reactor is designed to fulfill the surface power requirements of between 20,000 and 50,000 watts. A generator within the reactor transforms the nuclear energy into electric power. Based on a wireline design, the Mars surface Drill is a light, energy efficient and designed specifically for the Mars environment. Packed in one-metre lengths to be assembled by the crew on-site, the drill will be bolted to the ground for stability. The drill will be used by the crew to search for liquid water on Mars. While on Mars the crew will stay in the Atlantis Surface Habitat. Sent in advance, the Atlantis should be ready and operational for the crew’s arrival on Mars. This horizontal, cylindrical structure rests on an octagonal aluminum frame and stands a meter off the ground. At four meters in diameter and 10.6 meters long, it is like an advanced-technology mobile home. Although it will only have a single floor of working and living space, it will be well-equipped. 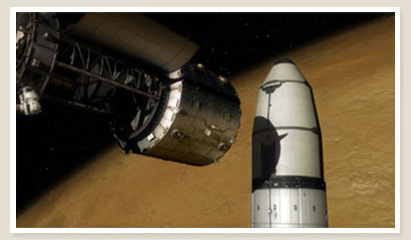 The main Extra-vehicular activity (EVA) and airlock facility will be electrostatically charged to remove Mars dust. A second pressure port at the back of the habitat will provide an emergency exit. The habitat will be fully equipped with necessary supplies, including food, oxygen and eight spacesuits (two are spares). It also includes crew compartments, a washroom with a shower, a kitchen, a dining table with seating for six and windows in the private crew bunks. The Atlantis will remain on the surface of Mars after the crew has departed for Earth.